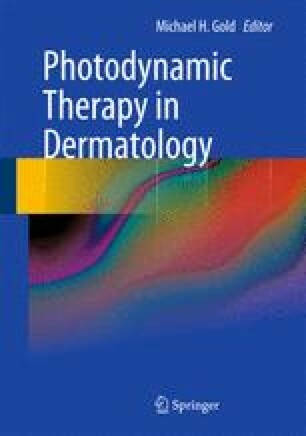 The use of fluorescence-guided PDT is thought to be a standard component in every PDT treatment, and in photorejuvenation to ensure treatment efficiency, and to reduce risk of post-treatment phototoxicity. As protoporphyrin IX, in contrast to ALA, fluoresces at 634 nm (at 407 nm excitation), the transformation of ALA can be monitored noninvasively by detecting the skin surface fluorescence. This method has in the past been used in experimental clinical studies to optimize mechanical skin preparation, type of precursor, incubation time, topical delivery mechanism (vehicle) as well as the concentration of ALA.
FluoDerm is a handheld device for objective real-time in vivo measuring of fluorescence. 2010. www.Dia-Medico.com. Accessed Feb 2010.